You are here: Home / Best Chainsaw for the Money / Best Chainsaw for the Money? Best Chainsaw for the Money? What’s the best chainsaw for the money? Well, it really depends on what you need. This is a very common question from homeowners but in truth, the best chainsaw for the money takes into is determined by the scope of your cutting projects — today and in the future. When I hear the question “What’s the best chainsaw for the money?” I interpret that as what’s an inexpensive chainsaw that’s reliable, well-constructed and worth my money. So, I’ve picked several chainsaws that I believe give you excellent value for your money — and most importantly, they’re good chainsaws that have proven themselves over time. Before we get into my breakdown of the best chainsaw for the money we have to get clear on on our goals. What type of cutting will you be doing? Pruning, limbing, felling trees, firewood? What’s the largest diameter of wood that you need to cut? What type of wood will you be primarily cutting? Hardwood or softwood? Does loud noise bother you? Will it annoy your neighbors? How long will you need to use your chainsaw when working? Will you be working close to an electrical outlet? By thinking about these questions you’ll be able to make a better decision about which chainsaw is the best chainsaw for the money — for you. Forget about what your neighbor uses or what friends recommend. You don’t need a gas chainsaw if all the wood you’ll be cutting is under 12 inches. A chainsaw would be overkill for you and a waste of money. Not all homeowners need to feel 30 inch trees on a regular basis. Within the article, I will recommend the usage of each chainsaw model to help you decide if it’s the best chainsaw for you. Whether you’re a chainsaw expert or if you’ve never used a chainsaw before; it’s essential that you protect yourself with chainsaw safety gear. Chainsaws are the most dangerous power tool for homeowners and therefore it’s imperative that you practice safety at all times. If you want the absolute best chainsaw then just buy a professional STIHL or Husqvarna chainsaw, but for homeowners it doesn’t make any sense to do that. This list is comprised of all consumer grade chainsaws. I have the Husqvarna 450 on my list as a bonus because it’s a little more expensive than most homeowner chainsaws but it’s an exceptional all-around gas chainsaw, capable of handling big jobs with ease. And all things considered, it’s very reasonably priced. I hope you find this list useful. If you have any comments or have any personal recommendations then send me a message and let me know. I love hearing from readers. Tool-less tensioning system prevents over-tightening. Designed with an effective chain brake for added safety. 3/8″ pitch reduced kickback chain. Best for: Light to medium-duty cutting under 12 inches. Limbing, pruning and firewood. Felling small trees. Downside: You’ll have to manage an extension cord. Not suitable for heavy-duty cutting. The WORX WG303.1 is an impressive electric chainsaw for less than $100. It’s been designed with homeowners in mind as it comes with an easy to use automatic chain tensioning system. It has an over-sized knob that’s used to secure the bar and chain, while simultaneously maintaining the proper chain tension as you work. This also removes the risk of over-tightening the chain, which increases the longevity of your chain. It’s quite powerful for an electric, being driven by a 14.5 Amp motor. It’s capable of cutting trees up to 14 inches in diameter but ideally it’s better suited for cutting wood under 12 inches. Like all chainsaws, this can cut wood larger than what it’s designed for but the problem is when you cut above the capability of your saw the motor begins to bog down and may struggle to cut the wood effectively. You also increase your risk of injury if you push a saw beyond its power ability. So, yes, you can cut wood 20″ in diameter occasionally but I would recommend this saw if you need to consistently cut wood that wide. Choose one of the gas chainsaws on the list if you’re tackling heavy-duty projects on a regular basis. For most homeowners this is an excellent all-around chainsaw that’s well-made and easy to use. Most people are surprised at how effective the WORX WG303.1 is at cutting because it is electric. Modern electric chainsaws are much better than they used to be. Also, it’s low maintenance and relatively quiet. It won’t annoy your neighbors as much as a gas chainsaw. It has a chain brake that will stop the chain quickly if kickback occurs and at only 11lbs it’s comfortable to work with for long periods of time. We have a full review of the WORX WG303.1, which I recommend you read if you want to know more about this chainsaw. I’m confident in including WORX WG303.1 on my list of: The Best Chainsaw for the Money. You’ll need a 12 gauge extension cord for this chainsaw. If you don’t already own one then the US Wire 74100 is well-priced and will ensure you get the optimal power from your chainsaw. Learn more about cords in our article entitled: Buying the Right Extension Cord. If you need a little more power then you can get the more powerful WORX WG304.1. All the features are the same except that it has an 18″ bar and chain and it’s powered by a 15 Amp motor. View or download the MANUAL for the WORX WG303.1 chainsaw. A powerful gas chainsaw with great features. Best for: Cutting wood up to 22″ in diameter. Excellent for medium to heavy-duty tasks, such as cutting firewood, felling trees and limbing. The Remington RM5118R Rodeo is a bargain in my opinion because not only do you get a powerful 51cc gas chainsaw but it’s packed with excellent features that make it comparable to much more expensive chainsaws. For example, it has front and rear anti-vibration handles which are a sign of a quality chainsaw, and also essential when using a powerful chainsaw which will cause more vibration when cutting. Read the first section of my article on Anti-vibration gloves to find out why you need to protect yourself from vibration. Or, read about Hand-Arm Vibration Syndrome (HAVS). This chainsaw is engineered for homeowners who need power to tackle heavy-duty projects on a consistent basis. It comes with large bucking spikes, a low kickback chain and a spring assist starting mechanism that makes it very easy to start. Watch this video and see the Remington RM5118R Rodeo in action. It’s an impressive chainsaw and absolutely deserves to be on my list of the best chainsaw for the money. The Remington RM5118R Rodeo is a fairly heavy chainsaw at 17.5 lbs. If you’re not physically fit then you might it difficult to use for long periods of time. The lubrication system works very efficiently, almost too well as it tends to use a lot of oil so make sure you stock up on bar and chain oil for this saw. It’s better to be well lubricated than dry. TIP : Some customers complain that this chainsaw leaks some oil when being stored but there’s a way to prevent that. There’s an adjustment screw for automatic chain oiling system, so turn the screw counterclockwise to shut off the flow of oil, to ensure the chainsaw does not leak oil while being stored. BUT make sure you turn the screw back to normal when you use the chainsaw otherwise it won’t lubricate. Very important. Unfortunately, the chain that comes with the Remington RM5118R is not very good and you might be disappointed if you don’t upgrade it. A chainsaw can only cut as good as the chain so I guess Remington saved a little money on the chain, but don’t let that turn you off because the guts of this chainsaw are solid and well-engineered. So, to save you some disappointment I suggest you buy the Oregon H72 18″ chain. It’s far cheaper than other chainsaws with the same features, but don’t let that sway you. It’s just a great value chainsaw. But yes, it’s heavy. View or download the MANUAL For the Remington RM5118R Rodeo chainsaw. View or download the PARTS LIST for the Remington RM5118R Rodeo chainsaw. 2 views of the RM5118R. 18″ bar and low kickback chain. Quick start system. Electronic ignition. 2-Step Auto Choke for quick warm up. Front and back anti-vibration handles. Reduces fatigue. Professional-grade crankcase, sprocket, and die-cast chassis. Automatic oiling system provides consistent lubrication to the bar and chain. Large bucking spikes for added leverage and safety. Comes with a heavy-duty case and scabbard (blade cover). CARB Approved For Sale In California. A solid gas chainsaw for medium to heavy-duty cutting. Durable 50cc stratified 2-stroke engine. Easy to start pull starting system. Tool-less access to air filter and spark plug. Built-in scrench holder and carrying case. Best for: Cutting wood up to 24″ in diameter. Excellent for medium to heavy-duty tasks, such as cutting firewood, felling trees. Downside: Heavy (15.5 lbs). Too heavy for excessive pruning or limbing. 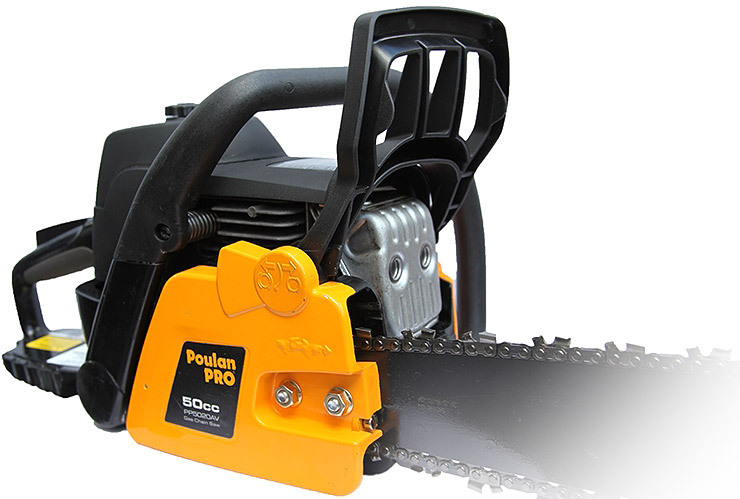 The Poulan Pro PP5020AV is another gas chainsaw for homeowners who want to maximize their budget and get the best chainsaw for the money. I recently wrote an in-depth review of the Poulan Pro PP5020AV which will give you a few more details but I’ll cover the most important points in this article. You should know that the Poulan Pro brand is owned by Husqvarna and some of the components from other Husqvarna saws are used in this chainsaw. No, it’s not a Husqvarna but it retains much of the quality of the Husqvarna brand, at a cheaper price. Again, not as good as Husqvarna but still a great value for the price. Powered by a 50cc engine, it has plenty of power to handle your large cutting projects. This is a very capable chainsaw that can fell large trees and cut firewood with ease. I don’t recommend this for limbing or pruning as it’s too heavy but you can obviously use it for short periods of time to do so when needed. One of the best features of this saw is the anti-vibration technology behind it, which is borrowed from Husqvarna so you know you’re getting an excellent anti-vibration system to protect your health as you work. I still recommend anti-vibration gloves when using any chainsaw because it’s important to do whatever you can to protect yourself. Also, you’ll be more comfortable when you’re working for long periods of time. Some other great features are the Super Clean air filter system, aluminum Professional style clutch cover, automatic gear driven oil pump, tool-less access to the air filter and spark plug, an easy pull starting system, a double post chain brake, and an on-board locking wrench holder in the rear handle. It comes fully assembled and includes a hard carrying case. I also recommend upgrading the bar and chain but you can read about that in the full review. Overall, this is one of the best chainsaws for the money if you have some serious cutting jobs to do. This is not meant for casual limbing or pruning but it’s perfect for felling medium to large trees and cutting firewood. View or download the MANUAL Poulan Pro PP5020AV. View or download the PARTS LIST Poulan Pro PP5020AV. 40V battery power is hard to find at a reasonable price. GreenWorks did it! DigiPro brushless motor will provide you up to 100 cuts on a single charge. Compatible with GreenWorks G-MAX 40V Li-Ion System. 16″ Oregon Bar and Chain. Brushless motor delivers up to 30% more torque & 70% less vibration. Chain brake and low kickback chain for greater protection. Fast-release trigger. Chains stops when you release the trigger. Quick & easy tool-less chain tensioning. Best for: Cutting wood up to 10″ in diameter. Excellent for small-duty tasks, such as pruning, limbing, firewood and small trees. Best used to cut softwoods. Downside: Working time is limited by battery. Extra battery is expensive. The GreenWorks 20312 DigiPro G-MAX is a battery powered chainsaw that packs quite a punch considering it’s running from a battery. Well, to be fair, it’s powered by a 40V battery, which is impressive. You’ll notice that lithium-ion tools are more expensive than gas or corded tools for one simple reason — the battery is expensive and that’s why this chainsaw is on my list for the “best chainsaw for the money.” You get a lot of chainsaw in this package. Thankfully, GreenWorks seems to have figured out a way to design an excellent Lithium-ion chainsaw that’s capable of handling medium-sized cutting jobs around the yard — at an affordable price. That’s the challenge that I had when putting this list together. I wasn’t just looking for great chainsaws but they also had to be inexpensive to maximize your budget. That was my focus and I hope I’ve succeeded in providing you with some reasonable options. First, let me just say that you get a 4 year warranty with this battery chainsaw. That’s unheard of. Can you think of another tool manufacturer that gives you a 4 year warranty out-of-the box? If you find one, let me know. Either way, it’s rare and further proof that GreenWorks stands behind their products, offering the longest warranty that you’ll find when buying a chainsaw. And to top that, the brushless motor has a 10 year warranty on it. I don’t know about you but when I buy a product I also consider how long I’ll be covered in case it breaks down and needs repair. Clearly, GreenWorks has you covered in the warranty department. Okay, but is the GreenWorks 20312 DigiPro G-MAX any good? Yes! Overall, this is a great battery chainsaw for small tasks around the yard. It’s perfect for pruning and cutting down small trees, as well as firewood. At only 12 lbs this chainsaw will be relatively easy to handle for most people. The only downside to GreenWorks 20312 is the fact that you can’t work for long periods of time due to the fact that it’s battery powered. The harder you push it the faster the battery will drain. It’s not about the length of time but rather how much of a demand you place upon the chainsaw. Because of that, I suggest you buy an extra battery (GreenWorks 29472 40V 4 Ah Li-ion) because you’ll likely need it, especially if you have a lot of work to do. I always recommend an extra battery with tools because tasks always take more time than you expect so it’s better to have a fully charged battery waiting for you while you’re working. Another great thing about having two batteries is that once you deplete one battery you can immediately start charging it — and then you can switch to your fully charged back-up. This allows you to work longer if you need to. I know an extra battery is expensive but if you have work to do then you need the extra power. Otherwise, I suggest you buy either the WORX WG303.1 or the OREGON CS1500. They’re both corded electric chainsaws but you won’t have to worry about batteries. Or you can buy a gas chainsaw, but it’s louder, pollutes and requires more maintenance but you can run it all day and night if you want to — all you need is gas. If you don’t need to do heavy-duty cutting then I suggest you stick with an electric or battery-powered chainsaws. Although, I know that there are many people out there who just love the smell and power of a gas chainsaw. I understand that you probably have your own personal preference, so go with what you’re most comfortable with. Another great thing about this GreenWorks 20312 DigiPro G-MAX chainsaw is that the battery is compatible with a wide range of GreenWorks products, so if already own a G-MAX power tool then you’re ahead of the game as you can use the battery from your other tool as your back-up battery. Or, you can slowly build-up your inventory of GreenWorks power tools and then you can think of buying an extra battery as an investment. The GreenWorks 20312 chainsaw definitely deserves a spot on the list for the best chainsaw for the money. You get the complete freedom and mobility of an impressive 40V battery powered chainsaw, as well as a 4 year warranty just in case something goes wrong. Power + Reliability + Peace of Mind = Best Chainsaw for the Money! What’s included? 16-inch 40V DigiPro chainsaw, 16″ bar & chain, 40V (4Ah) Lithium-ion battery, charger, carrying bag, owner’s manual. View or download the MANUAL GreenWorks 20312 40V chainsaw. 15 amp motor | 18″ (45 cm) reduced kickback guide bar and chain. Automatic oiler with translucent view-through window. Best for: Cutting wood up to 14″ in diameter. Excellent for small-duty tasks, such as pruning, limbing, cutting firewood and felling small trees. Downside: Can’t think of any. Perfect electric chainsaw. The OREGON CS1500 electric chainsaw is another corded electric saw on my list and I consider this pick to be a bit of an underdog as most people haven’t heard about this chainsaw. It seems to fly under the radar but I want to make sure it finds an audience because it deserves to be known. I wrote a Full Review on the OREGON CS1500 if you want more detailed information. OREGON has a strong reputation with chainsaw professionals as they are a leader in cutting chains, guide bars, and chain drive sprockets for chainsaws. The company has been around since 1947 so they know a few things about chainsaws. Read more about the History of OREGON. The one defining feature of this chainsaw is the fact that it’s the only electric chainsaw with a a built-in chain sharpener. Yes, you can sharpen the chain in less than 5 seconds by the use of a lever and guaranteeing that you’ll never have to cut with a dull chain ever again. It’s an amazing feature that makes me wonder why more manufacturers don’t include this in their chainsaws. OREGON has integrated their own patented sharpening system called PowerSharp, which can be purchased for other chainsaws. Watch the PowerSharp Video. You won’t understand a word in this video as it’s not in English but you can see how the built-in chain sharpener works. The OREGON CS1500 is packed with features, such as: Instant start, quiet operation, silent between cuts, lightweight, ergonomic and it has a chain brake for extra safety. Overall, this is a powerful 15 Amp electric chainsaw that does everything right. Honestly, it’s a perfect homeowner chainsaw that provides exceptional cutting power and build quality at an affordable price. The inclusion of the PowerSharp system makes it far more efficient that other chainsaws because it means that you’ll always be cutting with a sharp chain which compensates for the fact that it’s an electric and therefore limited in power. You’ll need a 12 gauge extension cord for this chainsaw — same as the WORX WG303.1. I like the US Wire 74100 because it’s well-priced, ensuring that you’ll get the optimal power out of your chainsaw. Small, lightweight and affordable. Very well rated. Oiling system for consistent bar & chain lubrication. Best for: Cutting wood up to 6″ in diameter. Excellent for pruning, limbing and cleaning up after a storm. Small light-duty jobs. Downside: Lacks power. Don’t expect it to do too tackle big cutting jobs. It’s not designed for that. The Black & Decker LCS1020 is on this list of the best chainsaw for the money because it’s very good at what it’s designed for — tackling small jobs around the yard. Light enough, small enough and powerful enough to make this a great chainsaw for anyone to use. guide bar lubricated. Slowly press the primer bulb on the oil cap three times before making each cut. The beauty of Black & Decker LCS1020 is in its simplicity. It’s considered the best chainsaw for the money because it’s quiet, effective and extremely light at 7.2 lbs, making it easy to use without straining yourself. It has enough power to handle small jobs and nothing more. It’s the type of tool that you leave on the patio and pick-up effortlessly whenever you want to do some trimming. It’s straightforward and accessible to anyone. I recommend you buy an extra battery (LB2X4020-OPE 4.0 Ah) — with double the battery life — and the Black & Decker Fast Charger to maximize your usage of the Black & Decker LCS1020. Obviously, it’s up to you what you want to do but batteries don’t last long if you do a lot of cutting. And, if you really want to get the most out of this chainsaw then get the fast charger, which allows you to charge your 20V batteries in under 40 minutes. View of download the MANUAL for the Black & Decker LCS1020 chainsaw. Centrifugal air cleaning system. Work longer between filter cleanings. 3.2 HP X-Torq Engine: Improved fuel efficiency and less exhaust emission levels. Quick-release air filter: Easier to clean and replace your air filter. Ergonomic rear handle and trigger. Felling marks: Improved felling guide. Combined choke/stop control. Easy to start and minimize chance of flooding. Three-piece crankshaft: Forged 3-piece crankshaft for greater longevity. Best for: Cutting wood up to 24″ in diameter. Excellent for medium to heavy-duty tasks, such as cutting firewood, felling trees, limbing, pruning, and cleaning up after a storm. Downside: On the expensive side in the eyes of consumers but it’s worth the price if you have a need for power and efficiency. So here we are. My bonus pick for my list of the Best Chainsaw for the Money! I decided to include the Husqvarna 450 gas chainsaw because, although it’s the most expensive chainsaw on this list, it’s still an exceptional package filled with professional grade features within a price range that consumers can afford. What’s so impressive about the Husqvarna 450 is how light they’ve managed to make it. It’s only 10.8 lbs (without bar & chain) which makes it quite lightweight and easy for most people to work with for long periods of time. Comparatively the Remington RM5118R Rodeo is 17.5 lbs and the Poulan Pro PP5020AV is 15.5 lbs — and they’re about the same in engine power. How did Husqvarna manage to create such a powerful gas chainsaw and keep it so light? Well folks, that’s engineering. The Husqvarna 450 is an extremely well-balanced chainsaw that has proven itself over time. It’s been tested and refined over the years and what remains is a powerful chainsaw that remains ergonomic, easy to start and comfortable to hold in your hands. It has excellent anti-vibration technology that protects you as you work. You don’t have to worry about feeling numb after using the Husqvarna 450, although anti-vibration gloves are still beneficial. It has an effective inertia chain brake that will protect you from injury if and when kickback occurs. There’s a long list of features that you can read below so I won’t go over them here. You get what you pay for and in this case you pay a little more money for a chainsaw that will last you many years to come. Now, I don’t recommend this gas chainsaw for anybody. This is a serious professional-grade chainsaw that should be handled by someone who knows how to use a chainsaw and has a need for heavy-duty cutting. You don’t need a Husqvarna 450 if all you want to do is some limbing and pruning. You don’t need the Husqvarana 450 to fell small trees under 12 inches. For the average homeowner this chainsaw would be overkill but if you do a lot of cutting and need to consistently cut wood over 16″ in diameter and you have the budget then you cannot go wrong with the Husqvarna 450. If you have the same needs as stated above but don’t have the money then you’ll also be extremely happy with the Remington RM5118R Rodeo or the Poulan Pro PP5020AV. They are very good, but can’t match the quality or overall ergonomics and quality of the Husqvarna 450. The best chainsaw for the money? Husqvarna 450. Absolutely! If you want a little more power then go for the Husqvarna 455 Rancher. Same great quality, but capable of handling larger trees with its bigger engine and 20″ bar and chain. View or download the MANUAL for the Husqvarna 450. What’s The Best Chainsaw for the Money? Well, I’ve given you seven excellent choices for the best chainsaw for the money. If you can’t decide upon one then perhaps you still need to figure out what your needs are. The best chainsaw for you stems from what you want to do with it. How much cutting will you be doing and how large (in diameter) will the wood be that you need to cut? It’s simple. Once you know those things then you’ll be ready to choose the best chainsaw for the money — well, actually, it’s the best chainsaw for your money. If you disagree with my choices then send me your own “Best Chainsaw for the Money” list. Use my Contact page.